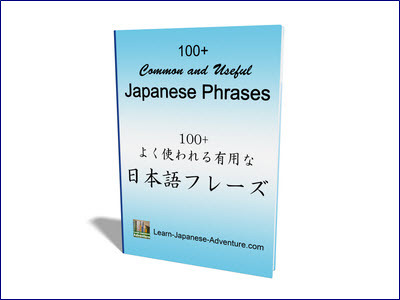 Over here you can use Japanese numbers to read dates such as days of the week, days of the months and months of the year, plus some relative time periods. 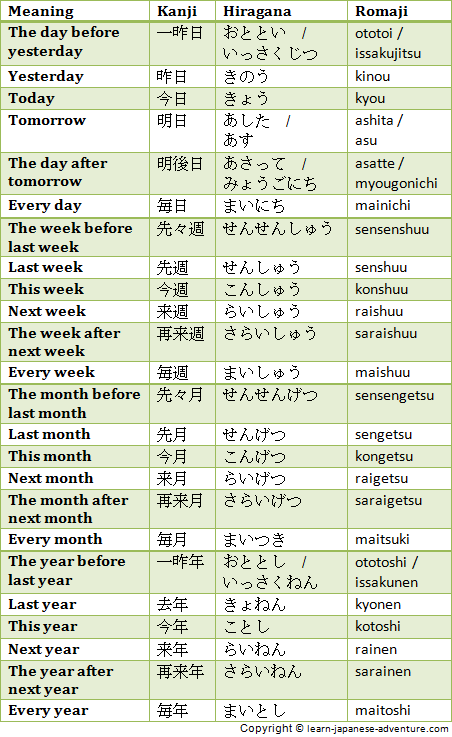 Days of the week in Japanese are easy to remember. Each day ends with the word 曜日 (youbi), which means "day of the week". The only difference lies in the first character. 月 (getsu) means moon, so Monday is the day of moon. 火 (ka) means fire, so Tuesday is the day of fire. 水 (sui) means water, so Wednesday is the day of water. 木 (moku) means wood, so Thursday is the day of wood. 金 (kin) means gold, so Friday is the day of gold. 土 (do) means earth, so Saturday is the day of earth. 日 (nichi) means sun, so Sunday is the day of sun. 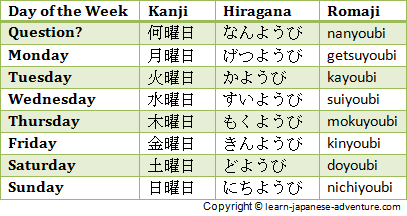 In Japan, you will most likely see that only the first character is used to represent the days of the week. 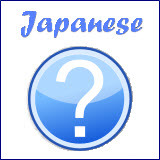 Like for example in newspapers or the business hours of shops, the Japanese usually use (月), (火), (水), (木), (金), (土) and (日). In Japanese, months of the year are also quite straight forward. The month 月 here is read as gatsu (not getsu) when it is used for months of the year. 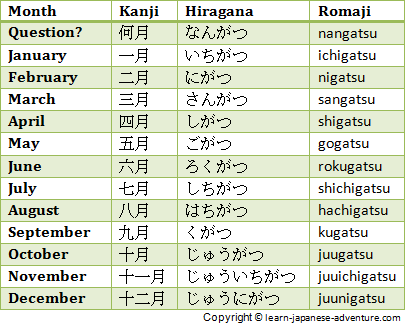 Simply add the Japanese numbers of 1 to 12 in front of 月 to form the months from January to December respectively. Be careful for the pronunciations for April, July and September. While normally yon (4), nana (7) and kyuu (9) are used in Japanese numbers, shi (4), shichi (7) and ku (9) are used when reading these 3 months. 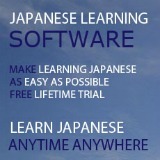 Foreigners tend to make mistakes when reading these. There are more to remember when it comes to the Japanese days of the month. Firstly there are special readings from the 1st to 10th days. Pay attention to the difference between the 4th and the 8th. The 4th is read as よっか (yokka) using sokuon, whereas the 8th is read as ようか (youka) using chouon (long vowels). 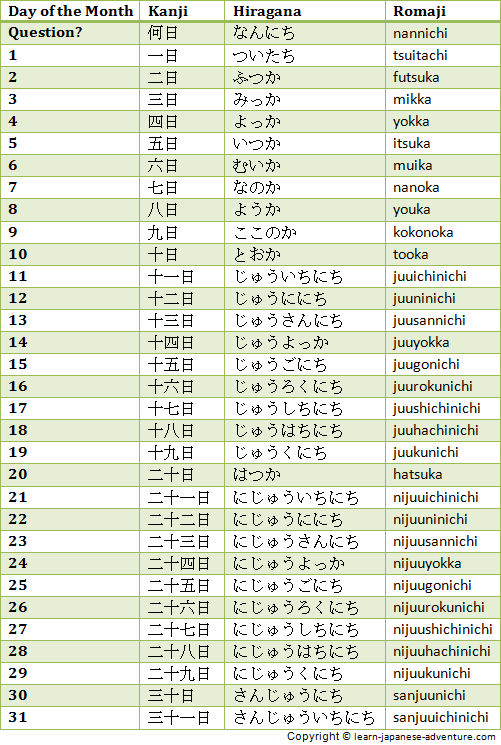 For the rest of the days, add the respective Japanese numbers to 日 (nichi) to get the readings. In addition, there are some terms like yesterday, today, tomorrow, last year, this year, next year, etc, that you can use to address different relative time periods. The table above shows the different relative time periods commonly used. Take note that there are two readings for some time periods such as tomorrow, the day after tomorrow, etc. The second readings are usually used for formal occasions.